Rockstar Games gab heute bekannt, dass man den bisher exklusiven DS-Titel GTA: Chinatown Wars nun auch für die PSP umsetzen wird. Ob eventuell die etwas geringen Verkaufszahlen der DS-Version der Grund dafür sind, ist genauso unklar wie die Umsetzung der Touchpen spezifischen Minispiele und Aktionen. New York, NY - June 22, 2009 - Rockstar Games, the world-renowned publishing label of Take-Two Interactive Software, Inc. (NASDAQ: TTWO), is pleased to announce that one of the highest-rated handheld games of all time, Grand Theft Auto: Chinatown Wars, will be making its way to the PSP (PlayStationPortable) handheld entertainment system. Developed by the award-winning studio Rockstar Leeds, in conjunction with series creator Rockstar North, Grand Theft Auto: Chinatown Wars will be available at retail on UMD and digitally from the PlayStationNetwork in North America and Europe this fall. 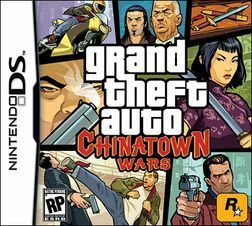 "We're proud to extend this truly unique handheld Grand Theft Auto experience to PSP and offer a downloadable version of Chinatown Wars for PSPgo," said Sam Houser, Founder of Rockstar Games. "Rockstar Leeds has shown incredible talent in creating games that raise the bar in terms of depth and innovation on portables, and with Chinatown Wars we have a rich, fast-paced, and incredibly addictive entry into the series." "Rockstar's work with the GTA series has been an enormous part of the success of PlayStation platforms," said Jack Tretton, President and CEO of Sony Computer Entertainment America. "We're excited to welcome the critically acclaimed Chinatown Wars to the outstanding line-up of great games headed to the PSP platform this fall." Grand Theft Auto: Chinatown Wars follows the story of Huang Lee, a young Triad who travels to Liberty City after the mysterious death of his father. Within the game, players will navigate their way through the streets as they uncover the truth behind an epic tale of crime and corruption within the Triad crime syndicate, delivering the unprecedented amount of depth that has become a true trademark of the franchise. Specifically built for the PSP platform with upscaled widescreen graphics, enhanced lighting and animation; and including all-new story missions; this version of Grand Theft Auto: Chinatown Wars will take full advantage of the power of the PSP system. also, das spiel macht auf dem ds echt rießig spaß, da stört die grafik auch nicht weiter. Die alten GTA Teile waren für mich auf der PSP fast unspielbar, da sie einfach nicht dafür ausgelegt waren. Bin mal gespannt wie das bei diesem Titel wird. Nein, der DS Teil kann auf dem DS eine Super Grafik liefern, eine tolle Steuerung und ein mega gutes gameplay. Auf der PSP wird es definitif schlechter.